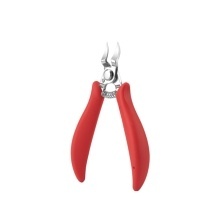 This Nail Clippers is easy to operate, comfortable to grip. The curved blade is matched with the corners of the nails for safe operation and easy trimming. Perfect tool to remove dead skin, hangnails, make the fingers and toes neat and smooth. Curved Edge is matched with the corners of the nails for safe operation and easy trimming. The handle is coated with non-slip material and ergonomic design, comfortable to hold and easy to operate. Precision-made blades give you a smooth and clean cut on hard and thick fingernails or toenails , cutting toenails faster.